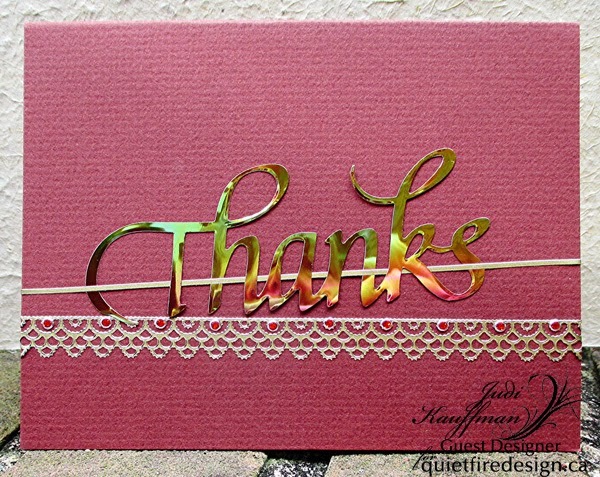 Hello Crafty Peeps, Terre here with cream and red card decked out with a beautiful sentiment stamp from Quietfire Design. 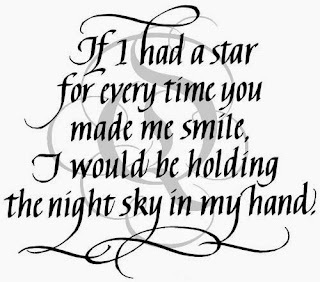 This beautiful sentiment is called A Smile That You Send Out, it is amazing how just reading this sentiment makes you smile. 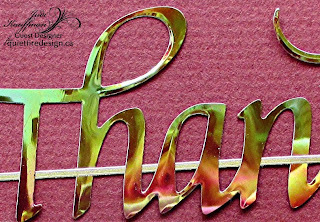 The die template that I used is from Spellbinders, the ink is Rhubarb Memento Ink from Tsukineko. The pearl accents used are from Want2Scrap. 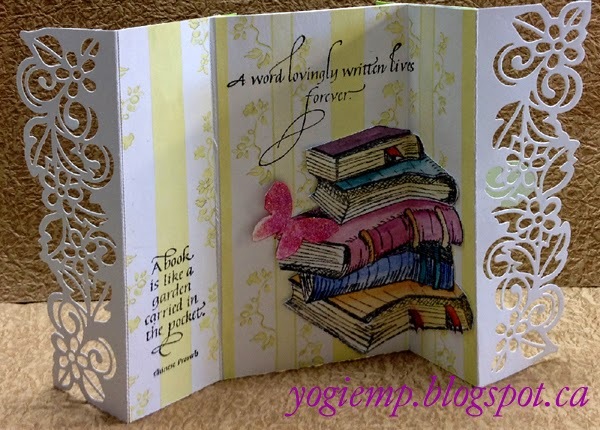 I attached my die cut piece to the cardstock using Scrapbook Adhesives by 3L Foam Squares. Happy Wednesday!!!! It's Wanda here today to share a card!! 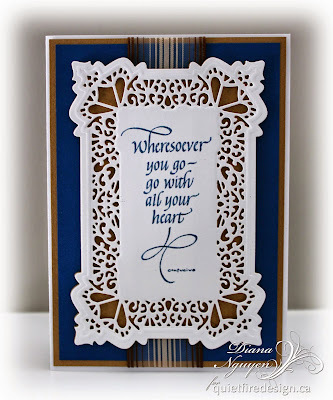 The card base is a new cut file, happy birthday edge script card. 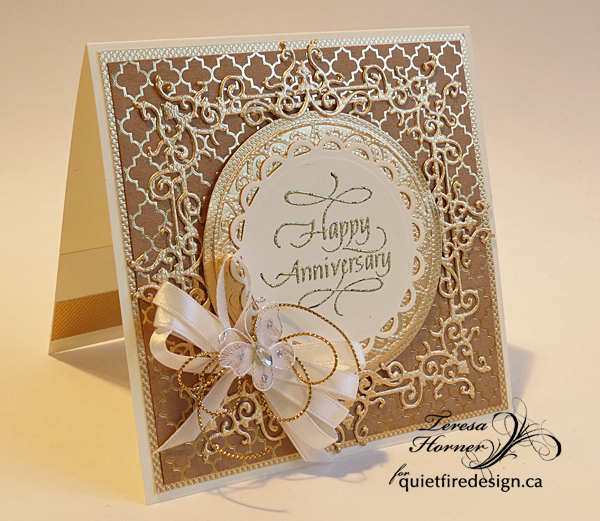 It was cut from a textured cardstock (Core Impressions: Jenni Bowlin brown and cream collection). I lightly sanded the front keeping away from the letters. 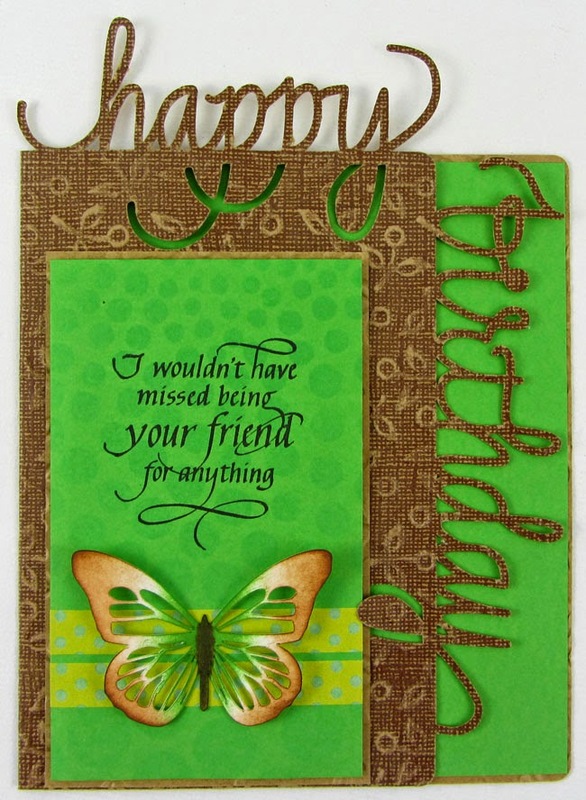 I cut a piece of green cardstock to attach inside, just on the right side, so there would be color behind the word birthday. I cut another piece of green cardstock for the front, sponged Distress Ink through a stencil for the design in the background, stamped the quote, I wouldn't have missed being your friend, with Archival Ink jet black, and added some washi tape. The butterfly is also a cut file from the file butterfly circle. 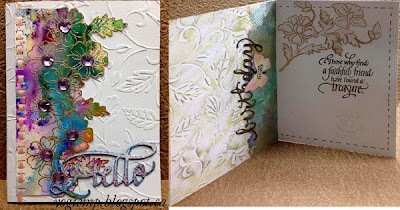 It was cut from white cardstock and color added with Distress inks and a Distress marker. 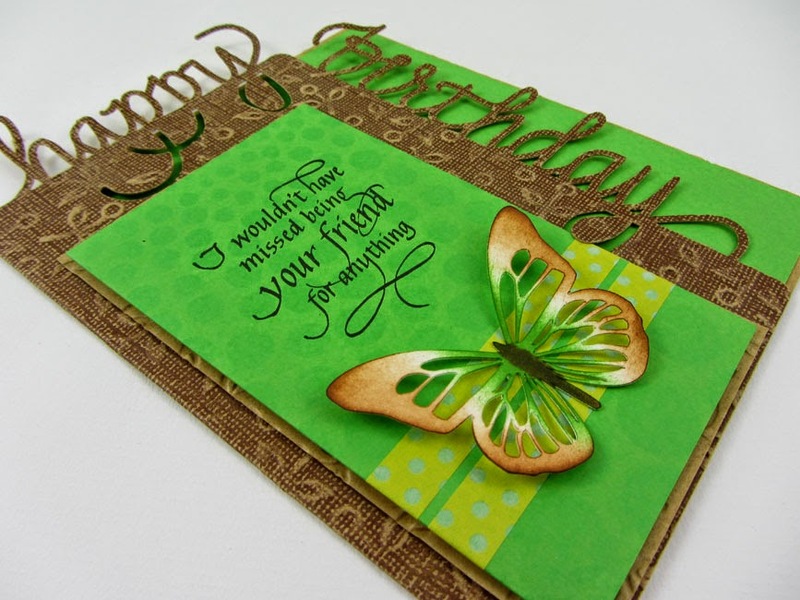 There is a layer of cardstock between the green and the card. 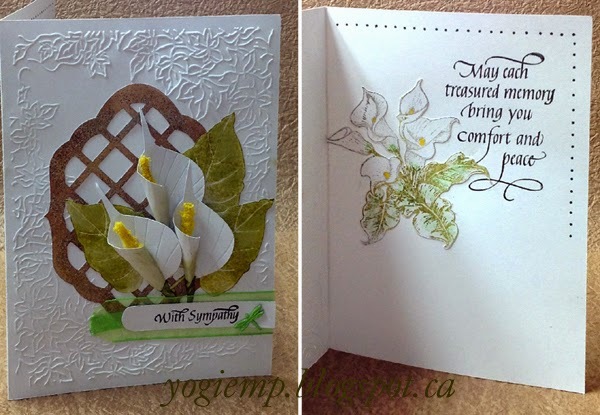 It is the same cardstock as the card is made from, but I turned it over so the kraft-colored side showed. frame for it too. It's perfect and very simple to use. that it would really be rich and classy looking. butterfly that i had in my stash. 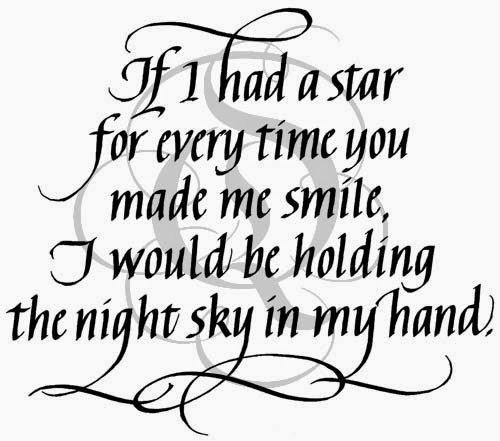 I really love this one and love this sentiment. 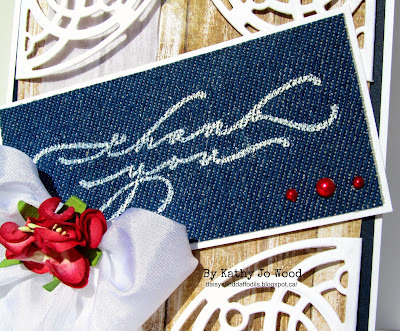 Thanks so much for stopping over... and have a wonderful day! 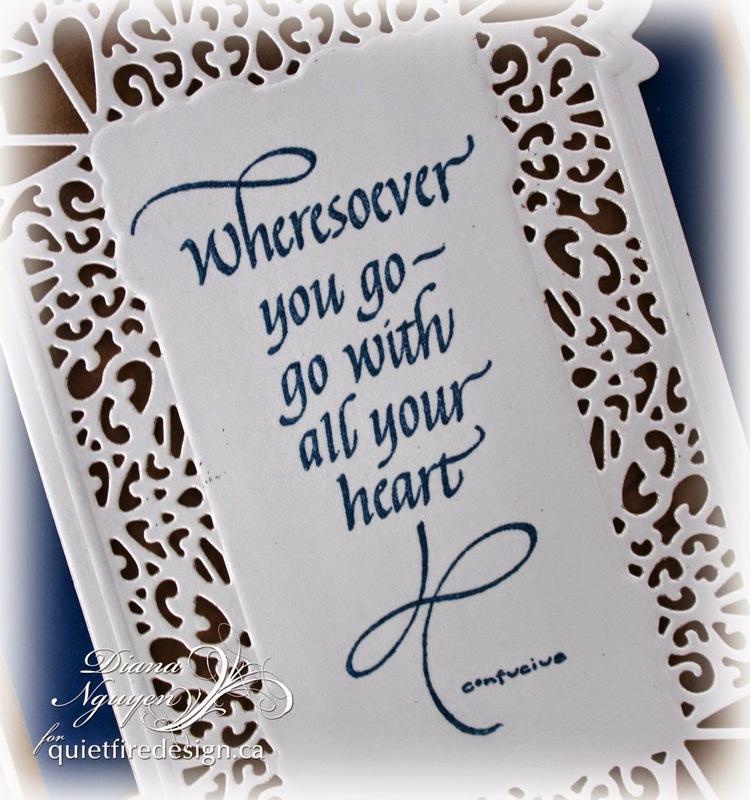 Yvonne here today with a card that will make any receiver happy, just by reading the text of this gorgeous Quietfire Design stamp. 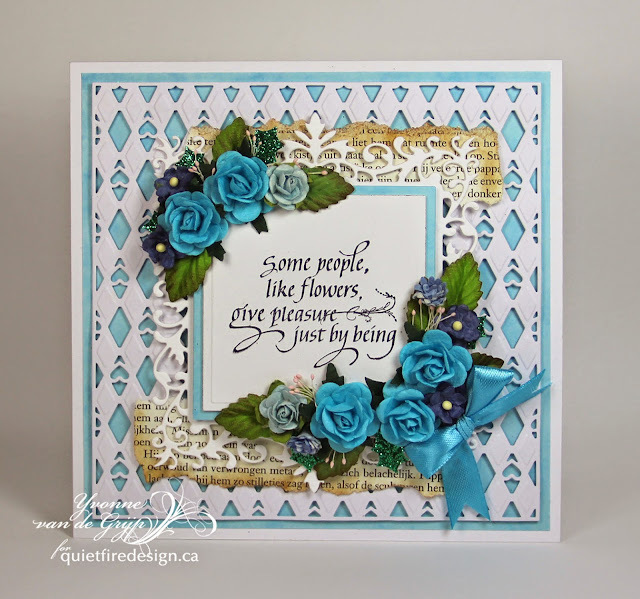 old book page and lots and lots of mullberry flowers! and hugs to you all! 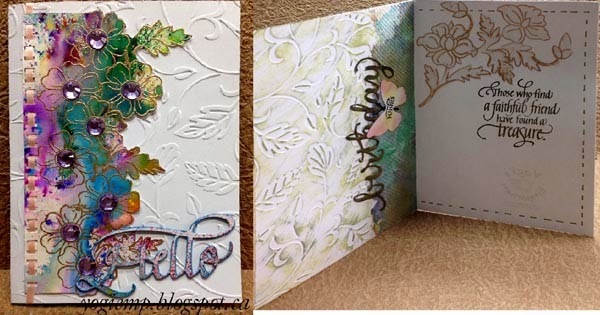 I'm using the newest "Hello" die on the outside; a quote stamp (Always Be My Friend... 3pce set) and sentiment stamp (10 tiny tag sentiments 10pce set) on the inside from Quietfire Design as well as an eCut (Happy Birthday) from Suzanne available on the Silhouette onLine store. Side folded my white cardstock (5"w x 7"h). Embossed using Ecstasy crafts "Leaves" embossing folder. 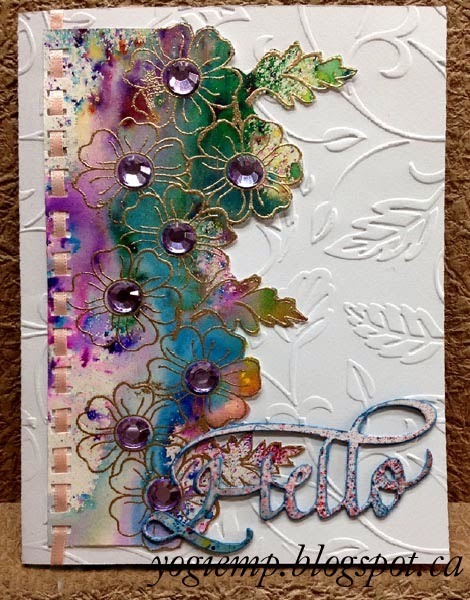 I sprinkled the ColorCraft powders onto misted Canson Biggie watercolor paper (smoother - backside), then misted some more. 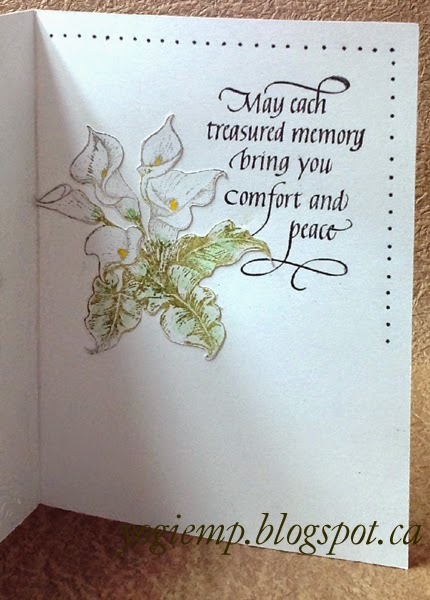 Dried and stamped the flowers (AlteNew ""Floral Motifs") using Versafine Toffee" and embossing with Queen's Gold embossing powder. Fussy cut around the flowers to create the border. Used a slot punch to thread my salmon colored narrow ribbon through. 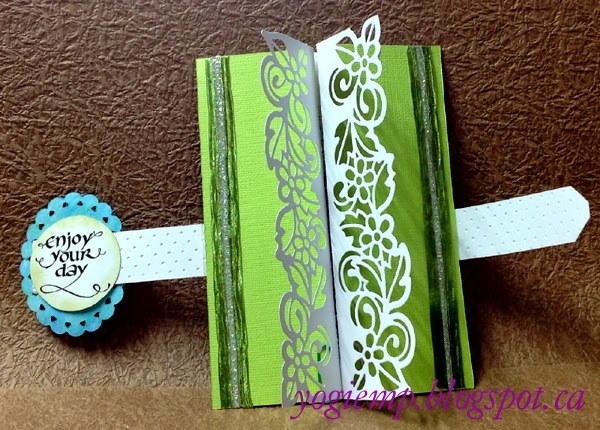 Adhered the border to the card front, adhering the ribbon tails to the inside. Die cut the "Hello" from a scrap section of the background. Then cut 3 more layers, coloring them with a blue Prisma colored marker, as well as the edges of the first die cut. Adhered all 4 layers together and then onto card front. Added the large mauve rhinestones to the flower centers. 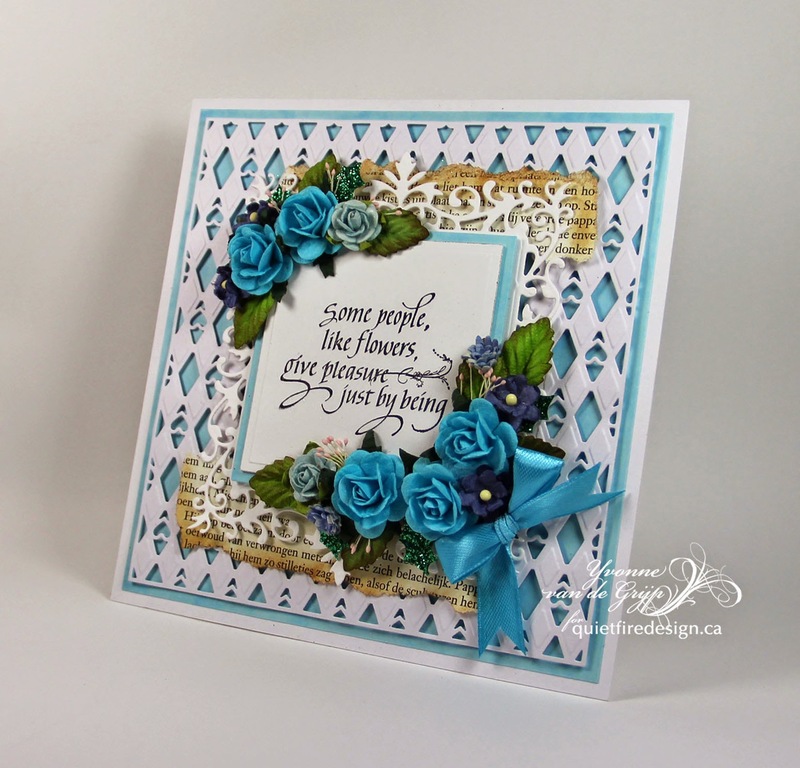 On the inside: hit the high points of the embossed background using Distress "Iced Spruce" and then with "Peeled Paint". Adhered a piece of scrap paper towel (from my Gelli print session at Artsy market...) using a glue stick. eCut the "birthday" at 5"w from white cardstock. 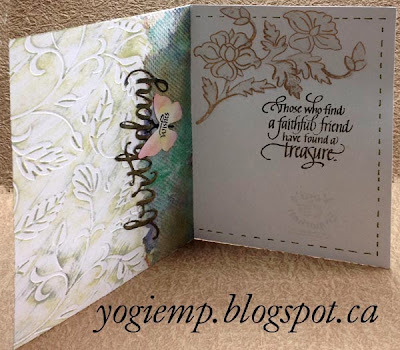 Colored with a black watercolor marker, then applied Versamark and embossed with "Oak Leak Olive" embossing powder - twice - to get a nice thick coat. 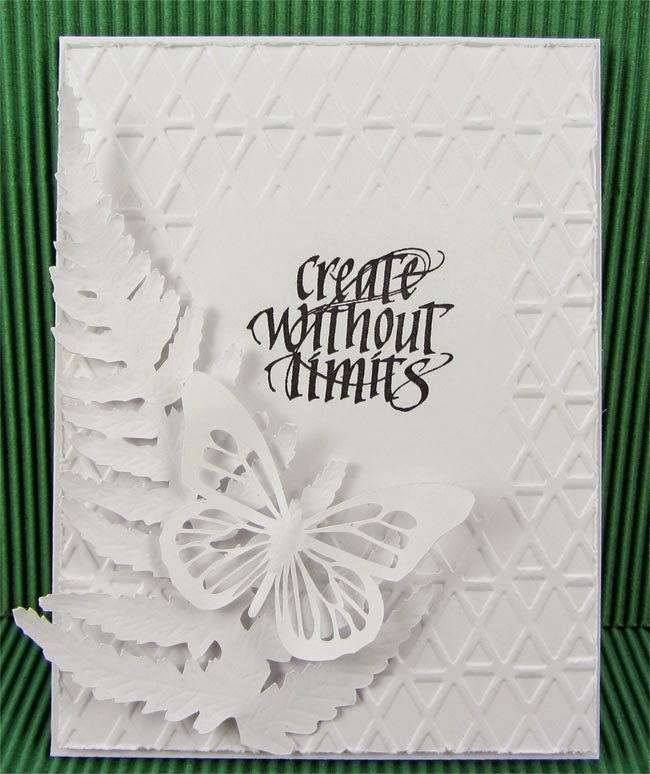 Masked and stamped the "wishes" (10 tiny tag sentiments ) onto white cardstock with the black, punched it out with Whale of a Punch "Butterfly", sponged using dirty sponges (raspberry & yellow), adhered to birthday word. 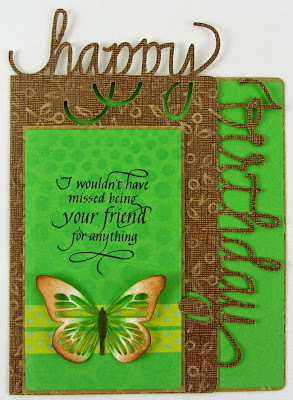 Stamped the quote (Always Be My Friend... 3pce set) with the Black, clear embossed. Added faux stitch lines using a Prisma Colored Marker in an olive tone. Hello! Hope your Monday is of to a good start. The days are going by so fast - summer will soon be here. And graduations! I thought this stamp would be great for any guy graduating this year. Though the die is very detailed, I think the blues and browns make a great masculine card. 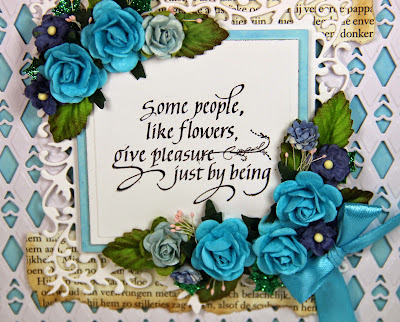 I used Sue Wilson's Spanish-Collection Seville die to frame this quote. I used kraft cardstock behind the white layer and added a wide ribbon to my blue and brown matting. 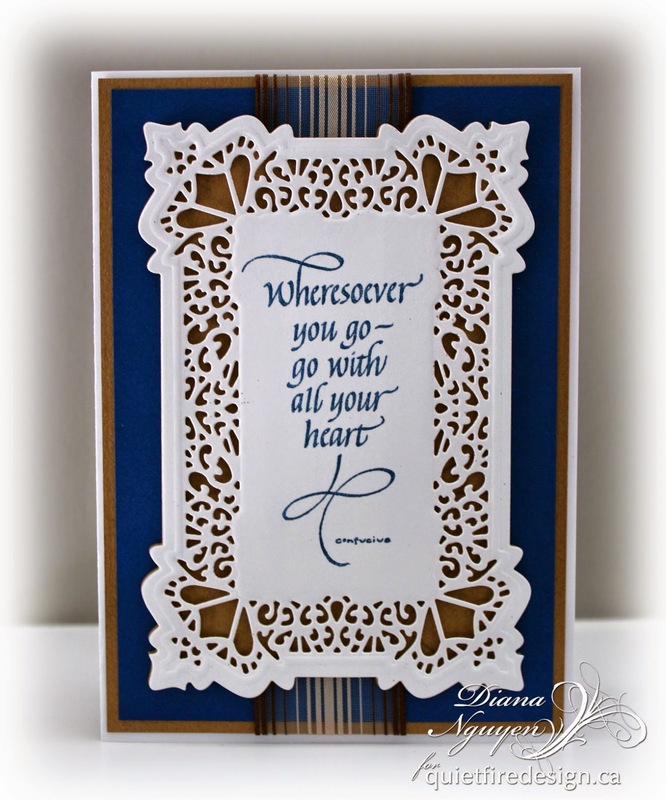 The quote was stamped with Memento Luxe Nautical blue pigment ink and then clear embossed. The card looks so clean and fresh. 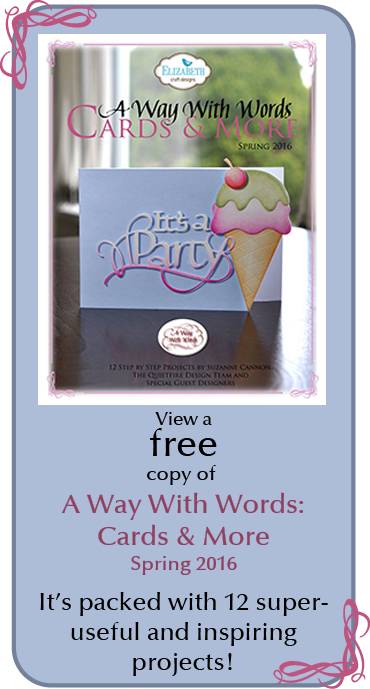 It will be a great card to give a hostess at a summer party or BBQ. Thanks so much for stopping by! 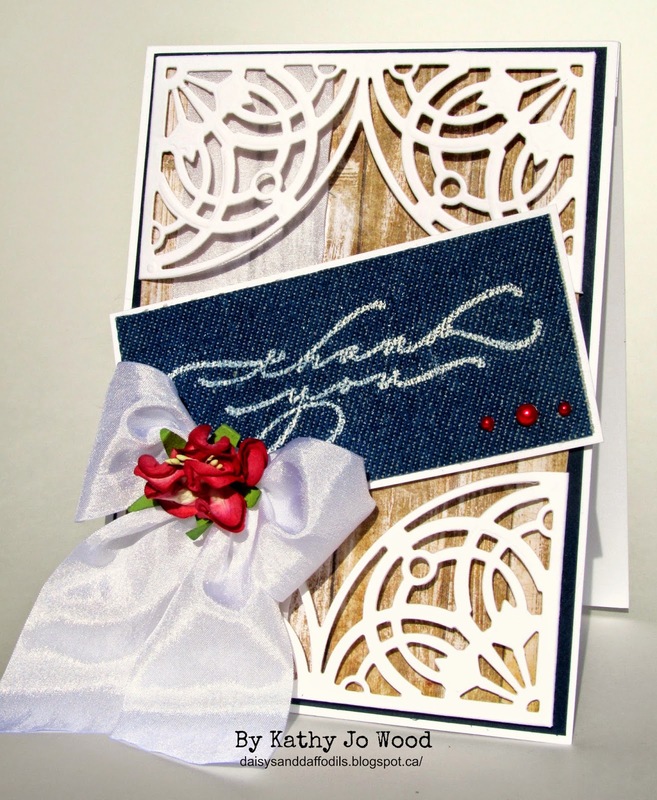 I do hope you enjoyed the card, the stamp set and the new die set. BTW, this is not the only new die set or crafty item at Quietfire- more new items to the Quietfire store can be found here. 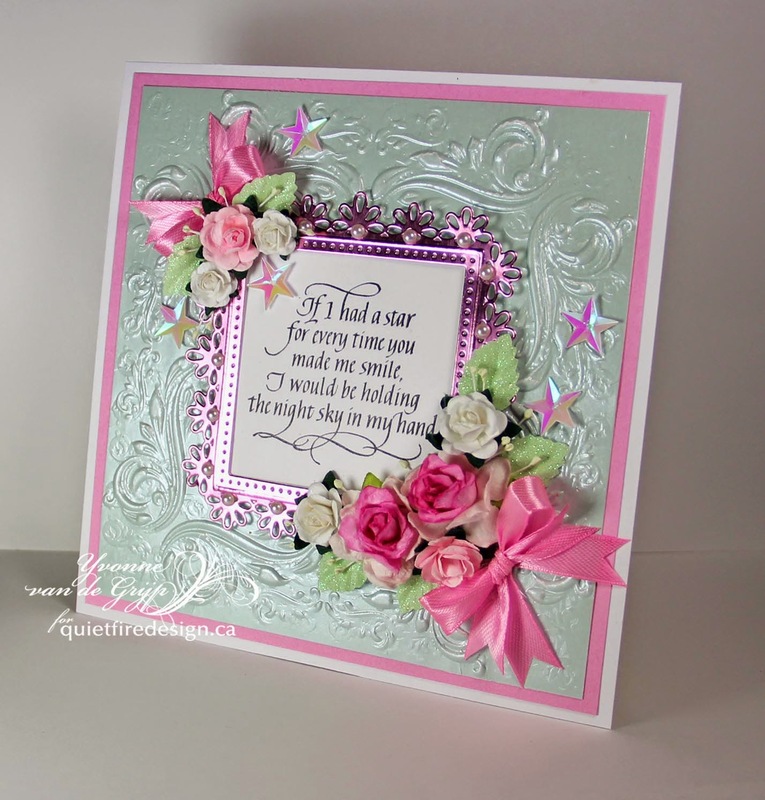 Hello Crafty Peeps, Terre here with a Quietfire Design twist, this project is not a card, can you believe that? I am using an oldie but goodie stamp set that just happens to match my favorite line if papers, Butterfly Circles, May the Wings, set of 5 stamps - Mounted. 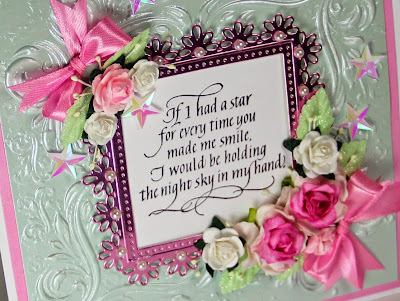 This wall decor project has been fussy cut and die cut and blinged up, not to mention stamped and inked, wow are you as tired as I am from describing all that was done in this project? 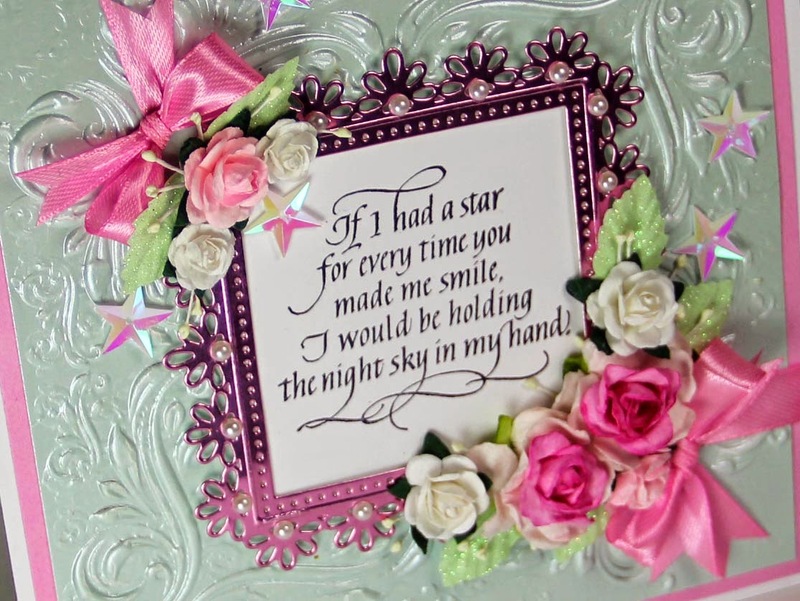 Who loves adding glitter glue to flowers to make them nice and shiny? I do! Hello!!! It's Wanda here today (waving). I can just about see the surprise on some of your faces at the lack of color on my card :-) Gasp!!! Over the past year (or so... time does get away from me) I've seen quite a few pieces using just white cardstock to put something together and how about paper sculptures all done in white (just google paper sculptures), they are amazing. So I challenged myself to go outside "my" box and work without color. It was hard!!! Every part of me cried out to add color. Now I probably cheated a little by adding texture but I couldn't help it, lol. 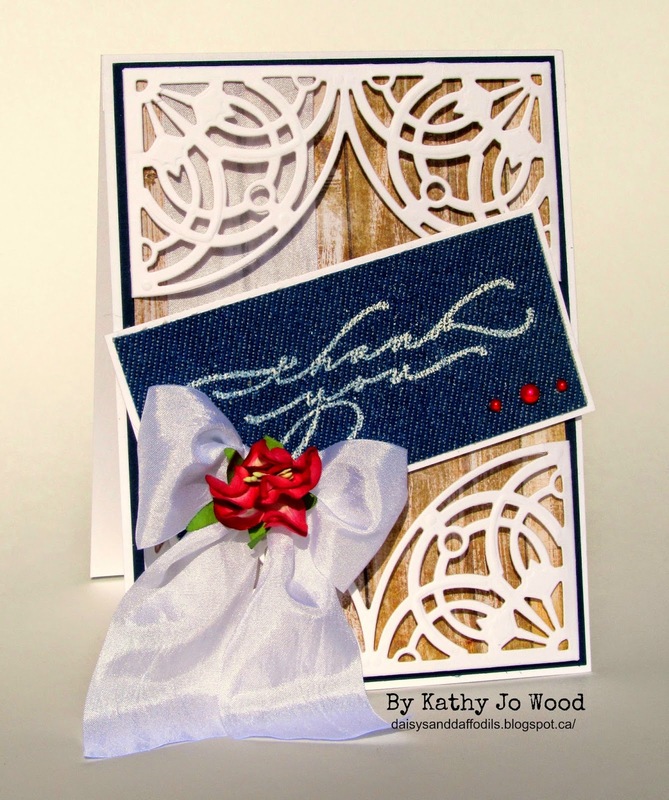 I used an embossing folder for the background along with a diffuser plate to keep the stamped area smooth. The fern and butterfly are both cut files and I used a stylus to add detail. so i chose a simple silver and white combination for it. in the dies perfectly so it really set off my beautiful stamped verse that i picked. a simple rhinestone on the top to finish it. It was super easy and fast too. Judi Kauffman shared a thank you card she made with Quietfire Design's "Thanks" die (cut from Fire Opal Gemstone Shimmer Sheetz). Instead of adhesive on the back of the word, she secured it to the card front with a thin gold peel-off line threaded through the letters like ribbon. To match the gold line she used a gold lace border peel-off, and to echo the orange tones in the Shimmer Sheetz she added orange Glitter Dots. So simple, so elegant. 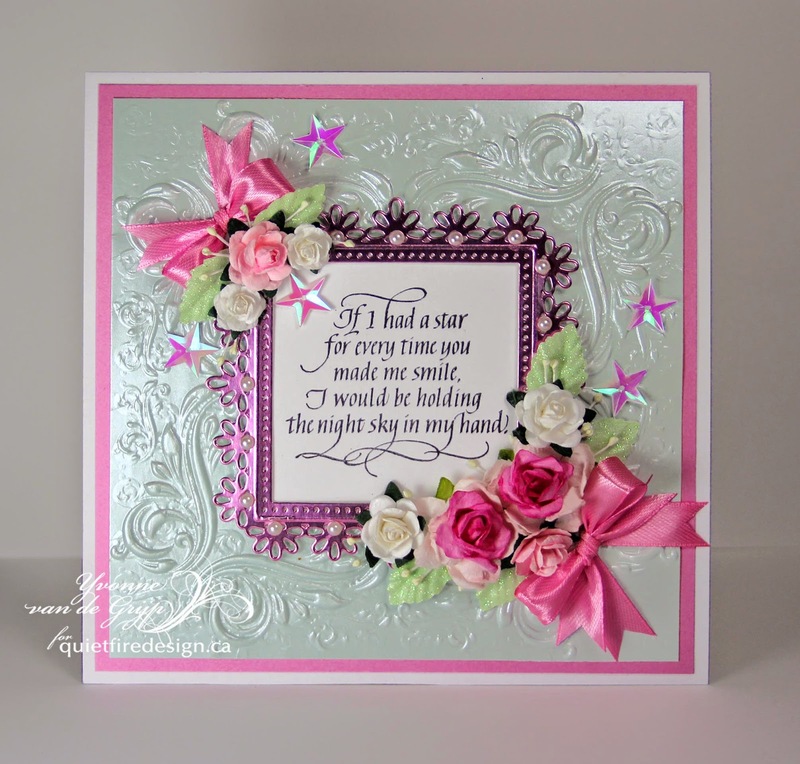 Yvonne here today with a new card. 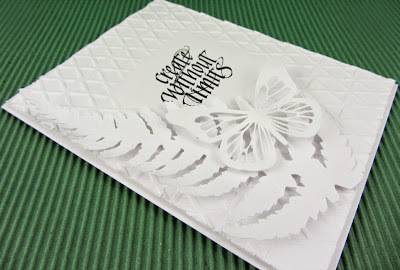 The card is made by simply layering, using an embossing folder and one set of die templates. 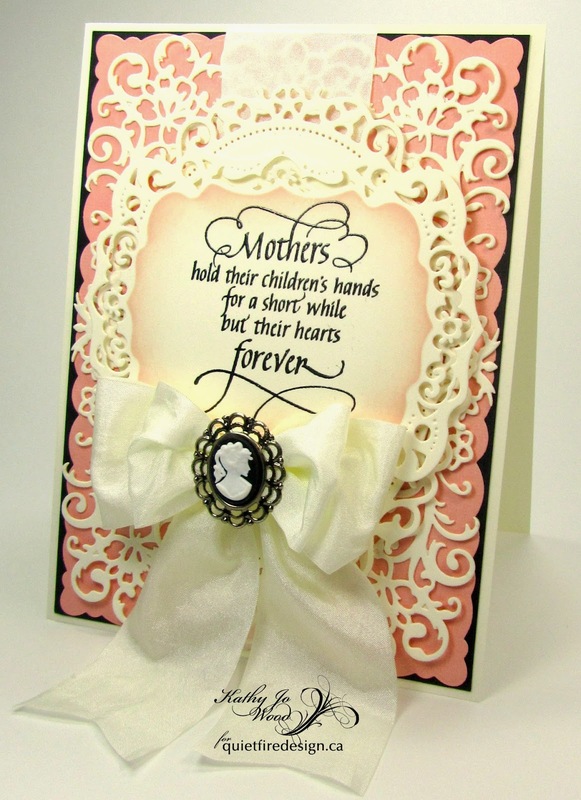 Using 3D foam squares give that extra 3D picture frame effect to the card. 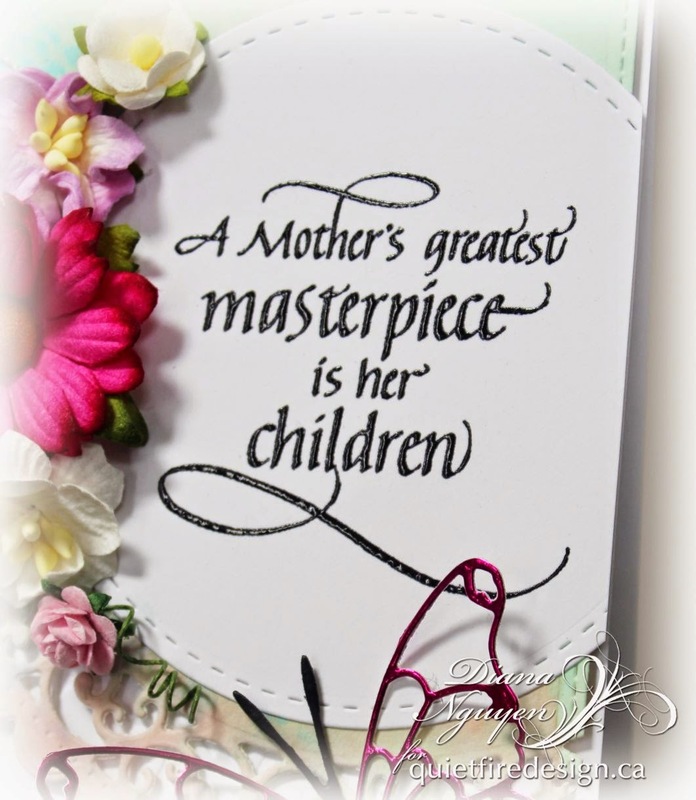 I hope you like the card I made and am looking forward to your comments! I scored and folded my white card. Embossed the front using Sheena Douglas "Ivy Frame" 5 x 7 embossing folder. eCut the frame at 4.5"h from white cardstock. Sponged with various Distress "Old Paper" and browns. Inked with Versamark and embossed with Distress embossing powders, sprinkling a little "Brushed Corduroy", "Pumice Stone" & "Walnut Stain". Heat setting and then brushing off the excess crystals. Adhered to card front. 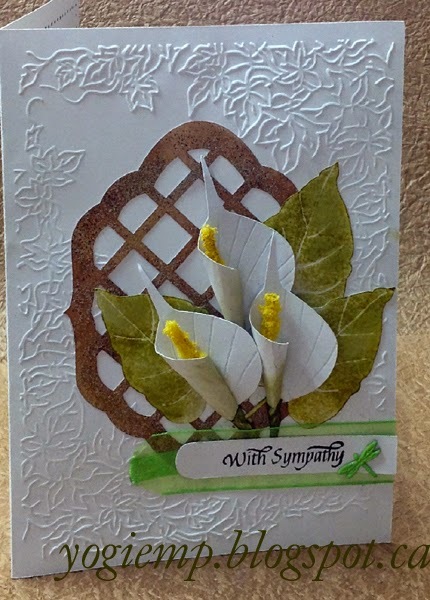 eCut the lilies from white cardstock, resizing the flower (white part) to 2.5"h and matching the other pieces to the flower to keep them in proportion. (I did this by placing all my elements on the mat, selecting them all, and then resizing in one shot). Added vein lines in the white part of the flower and the leaves using a small balled stylus. Used Distress colors "Shabby Shutters" and a bit of "Crushed Olive" direct to paper, and used a sponge to add the green to the base of the flower. Colored the yellow piece with "Mustard Seed", then added a glob of glue to the upper half and pressed a bright yellow flower soft into the glue. Set aside to dry. Shaped the flower around a paint brush handle. When I got the shape I liked glued down the edge. Adhered the stem piece shaping it a bit by pinching to round the straight line. Put a dab of glue on the inside of the flower and adhered my yellow pistol. 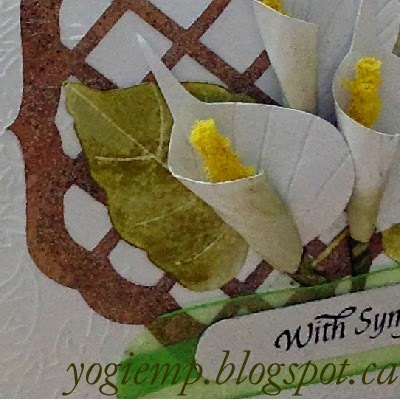 Adhered the leaves and flower to my card front. On the inside: stamped the quote with the black. Stamped the Calla Lilies (Flourishes) using "Pumice Stone" all over then using Distress marker "Shabby Shutters" on the leafy areas, misted with water and stamped. Colored the pistols with a yellow colored pencil. Fussy cut around the flower. 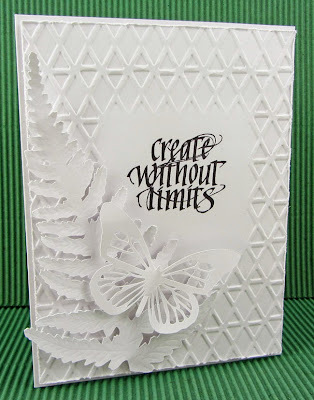 (actually eCut the shape after creating a silhouette image and then stamping the eCut...). adhered to inside of card. Added a dotted border using a Faber Castell black marker. click on any card image to enlarge. Enjoy. 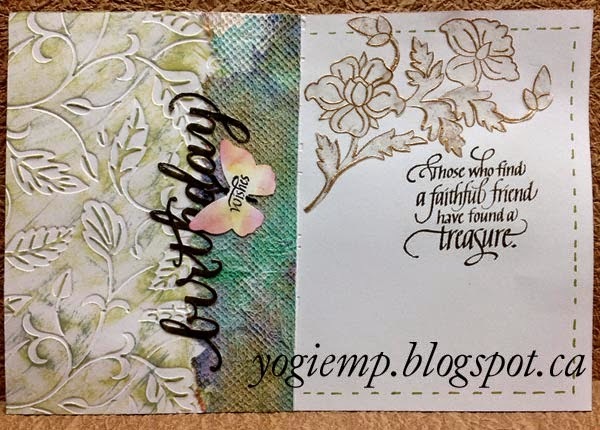 Yogi here today with a double "Z" card and using one of my favorite dies by Sue Wilson from Creative Expressions "Gemini - Delphinus"
I'm also using a quote stamps on the inside ("A Word Lovingly Written"); ("Nature Quote Marks" 7 pce set); ("Twirl & Enjoy" 3 pce set); from Quietfire Design and an eCut eCut ("HB2U"); available on the Silhouette onLine store. I Die cut my right and left side, then created my score lines... Since my cardstock was only 11"w, my front flaps were not 2.5" wide, so I added the green textured cardstock - it overlaps the fold edge by about 3/4". I then added the ribbon stripe detail on either side. 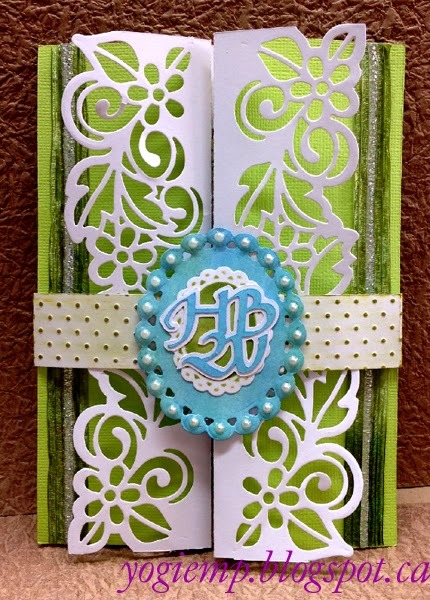 Created a buckle type closure using white cardstock, scored and folded where needed and embossed with Cuttlebug "Swiss Dots" embossing folder. Hit high points with "Crushed Olive" & "Bundled Sage". Adhered it to the back of the card. Created a loop to slip my belt into and adhered to the end of the left side piece. eCut the HB2U ("HB2U"); and a shadow eCut as well from white cardstock/ Colored the top layer with Distress acrylic daubers "Broken China" and then some "Cracked Pistachio" wiping off the excess with a paper towel. Adhered it to the white shadow layer. Die cut the two ovals (Spellbinders "Beaded Ovals") and painted the larger one with the blue & green. The smaller one I sponged with "Forest Moss". Adhered everything together. Adhered to buckle loop. Stamped the "Enjoy Your Day" ("Twirl & Enjoy" 3 pce set); with Versafine Black Onyx, clear embossed and cut with my EK Success circle scissor. Adhered to the backside of the buckle loop. On the inside adhered the yellow striped floral scrapbook paper - (Reminds me of olden day wallpaper...). Stamped the tower of books (Stampers Anonymous "Schoolhouse Blueprint" set), then scanned it, removed the blueprint lines and printed, then colored with watercolors. Fussy cut around it and adhered to the inside. The colored background is actually made with food coloring and dish soap. You can read about my process here. 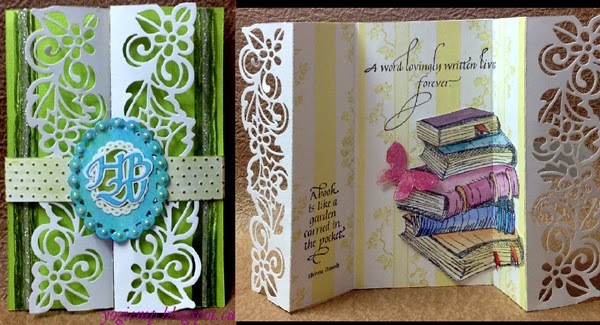 I used Spellbinders Curved Borders to trim it down. The base layer was embossed using Lifestyle Courtyard embossing folder. 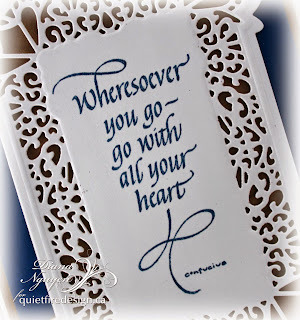 After I stamped and embossed in black detail embossing powder the quote was die-cut using Lil' Inkers Stitched Circles. The circle was popped up and placed on one side of the card - I love the look of the circle trimmed off. 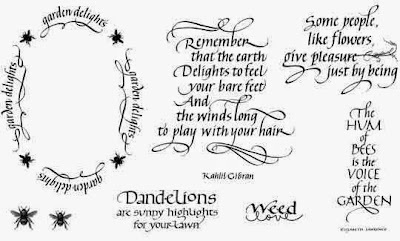 I added some silver twine and Wild Orchid Craft flowers to frame the circle. 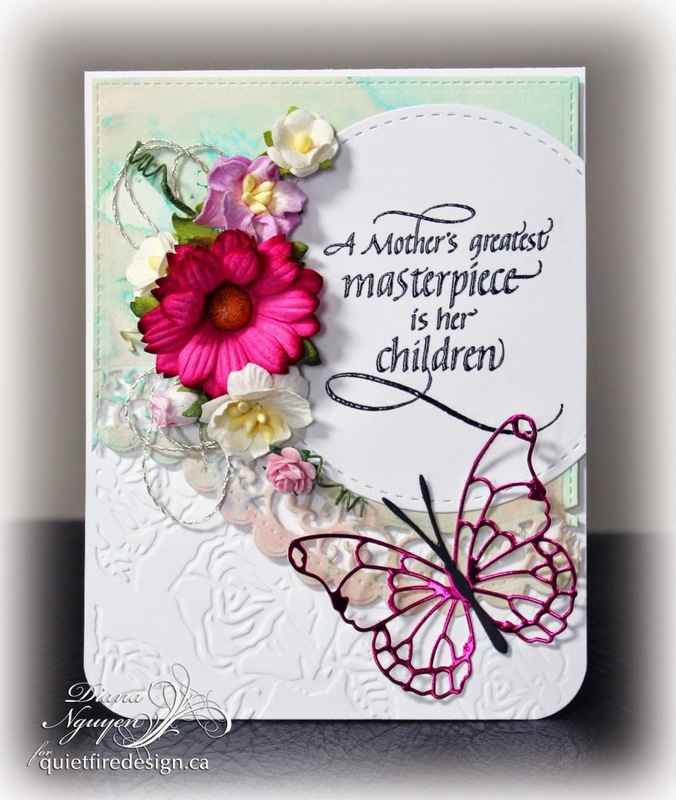 I then added a Memory Box Vivienne butterfly to the bottom of my card cut from Pucker Me Pink craft metal sheet. My final touch was to round off the bottom of my card. Don't you just love that flourish under the word children? I hope you like it and that you have a great week. 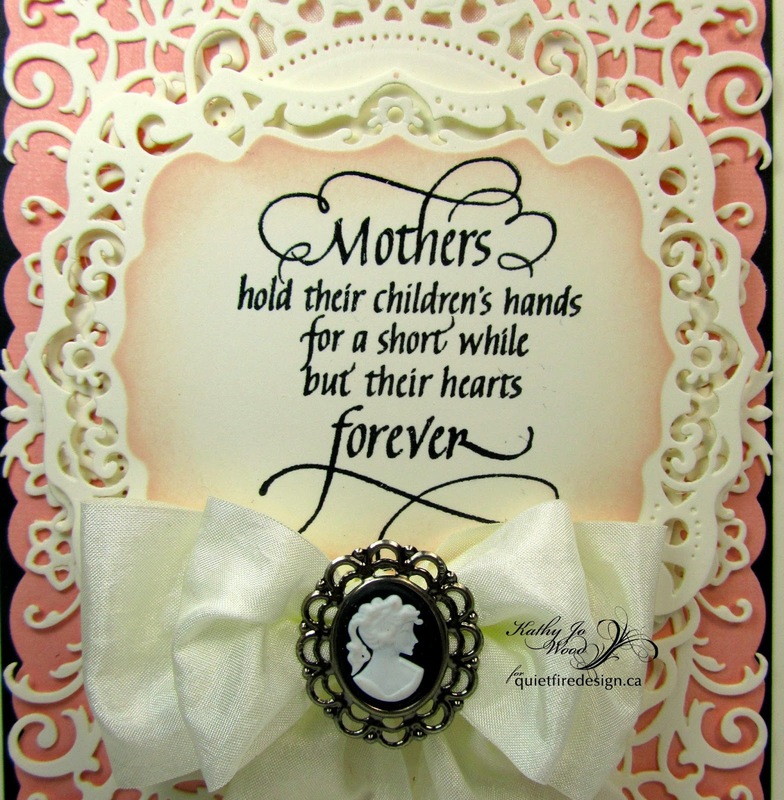 This is a perfect stamp for Mother's Day, mom's birthday or a "thinking of you mom" moment. There are several layers to the card (from the bottom up): tent fold ivory card stock base, black card stock, antique pink card stock cut using Spellbinders Romantic Rose, ivory card stock cut using Spellbinders Devine Floral, ivory card stock cut using Spellbinders Floral Ovals, and ivory cut using Spellbinders Labels 39. 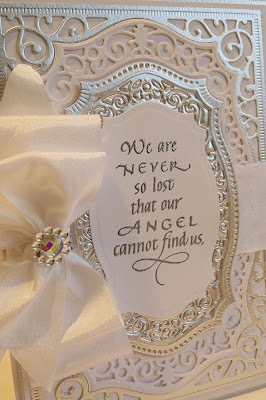 The sentiment was heat embossed on the ivory card stock prior to die cutting with Labels 39. Prior to popping out the die cut from the die, I applied Distress Ink in Tattered Rose in the areas shown. To complete the card, a double bow using the beautiful 1.5" wide ivory crinkle ribbon and a cameo embellishment applied using Zip Dry glue.